Item #SC-EFFZ-1752-X1: 14Kt. White Gold Earrings with two 14.4x17.3mm fancy Carved Tanzanites and ten round Diamonds of .09 cts. TW; Post and clip backs. Item #SC-EPFZ-1749-X1: 14Kt. White Gold Earrings with two 11x15.6mm fancy Carved Tanzanites; Post backs. Item #SC-EWFZ-1750-X1: 14Kt. 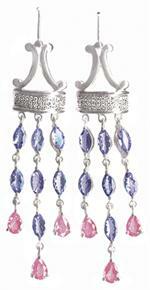 White Gold Earrings with two 11.5x19.6mm Fancy Carved Tanzanites of 16.97 cts. TW; Shepherd's hooks. Item #SC-EWFZ-1751-X1: 14Kt. White Gold Earrings with two 17.5x20.5mm pear shape Carved Tanzanites of 23.34 cts. TW; Shepherd's hooks. Item #AD-TZPS-E2400: 18Kt. White Gold Earrings of 14.66 gms. with six prong set pear shape Pink Sapphires of 3.17 cts. TW, fourteen prong set marquise Tanzanite of 4.62 cts. TW and .24 cts. pavéd Diamonds; Shepherds' Hooks. Item #RRS-TZ-2000: 18Kt. Yellow Gold earrings with two each pearshape Russian Raspberry Spinels and Tanzanites of 1.68 cts. TW, six marquise Diamonds of .30 cts. TW, and ten round Diamonds of .20 cts. TW with post & clip backs. Item #17394: 18Kt. Yellow Gold ring with one each 5x7mm pear shape Russian Raspberry Spinel of .71 cts. and Tanzanite of .98 cts., six marquise Diamonds of .32 cts. TW and five round Diamonds of .19 cts. TW. Size 7. Item #GSJ-28410/GSJ-2508-B: 18Kt. Yellow Gold Detachable Dangle Earrings with two prong set 7mm round Tanzanites of 2.82 Cts. TW, six tapered baguette prong set Diamonds of .37 cts. TW and seventy bead set round Diamonds of 1.12 cts. TW. Post backs. Item #CSJ-120: 14Kt. Yellow Gold Earrings with two prong set 5.1x7mm oval Tanzanites of 1.68 cts. TW and six prong set round Diamonds of .10 cts. TW. Post backs. Item #KK-ERT-2001: 14Kt. Yellow Gold earrings with 7mm round Tanzanites of approx. 2.00 Cts. TW, eight round Diamonds of .25 Cts. TW and post backs. 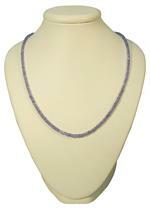 Item #RON-2057: 3/4" long 14Kt. Yellow Gold Pendant with prong set 6.7x8.7mm oval Tanzanite of 1.61 cts. and three round prong set Diamonds of .06 cts. TW. Item #KK-ERT-2007B: 18Kt. Yellow Gold Pendant with one half bezel set 6.5mm trillion Tanzanite of approximately 1.00 ct. and one bezel set round Diamond of approximately .03 cts. Item #15759: 18Kt. White Gold ring with 7.3x9.6mm oval Tanzanite of 2.91 Cts. and eighty-four round Diamonds of .85 Cts. TW. Size 7. Item #17358: 18Kt. Yellow Gold ring with 6.1x8mm oval Tanzanite of 1.24 Cts., twelve round Diamonds of .30 Cts. TW and twelve princess cut Diamonds of .75 Cts. TW. Size 6 1/2. Item #14687: Platinum ring with 13.2x18.3mm oval Tanzanite of 15.53 cts., thirty-four tapered baguette cut Diamonds of 3.89 cts. TW and twenty round Diamonds of 1.85 cts. TW. Size 6 1/2. Item #CSJ-118: 14Kt. Yellow Gold Earrings with two prong set 4.6mm round Tanzanites of .90 cts. TW. Post backs. Item #JM-314: 14Kt. Yellow Gold Earrings with two prong set 5.5mm round Tanzanites of 1.42 cts. TW; Post backs. Item #IC-165-04: 14Kt. Yellow Gold Earrings with two prong set 5mm round Tanzanites of 1.16 cts. TW; Post backs. Item #BK-ER-106: 14Kt. Yellow Gold Earrings with two prong set 4mm round Tanzanites of .60 cts TW; Post backs. Item #JM-975: 14Kt. Yellow Gold Earrings with two bezel set 5x10mm marquise Tanzanites of 2.53 cts. TW; Post backs. Item #SD-0137: 14Kt. Yellow Gold earrings with 3mm round Tanzanites of .25 Cts. TW and post backs. Item #KK-ERT-2008B: 18Kt. Yellow Gold Earrings with two 7mm round bezel set Tanzanites of 2.23 cts. TW; Post backs. Item #GSJ-2969: 14Kt. White Gold pendant with 9.5x9.5x9.9mm trillion Tanzanite of 3.50 Cts. Item #BK-1101-PDT-58: 14Kt. Yellow Gold pendant with 4x6mm oval Tanzanite of .50 Cts. Item #TNZ-PDT-2000: 18Kt. Yellow Gold pendant with 7.8mm round Tanzanite of 2.30 Cts. Item #15974: 14Kt. White and Yellow Gold ring with 6.2x6.9mm cushion Tanzanite of 1.36 Cts. Size 6 1/2. Item #15836: 18Kt. Yellow Gold Lady's Ring with one prong set 6.9x8.9mm oval Tanzanite of 2.70 cts. set in Platinum; Size 6½.